A little while ago the SpaceX Dragon spacecraft was captured by the robotic arm Canadarm2 on the International Space Station. 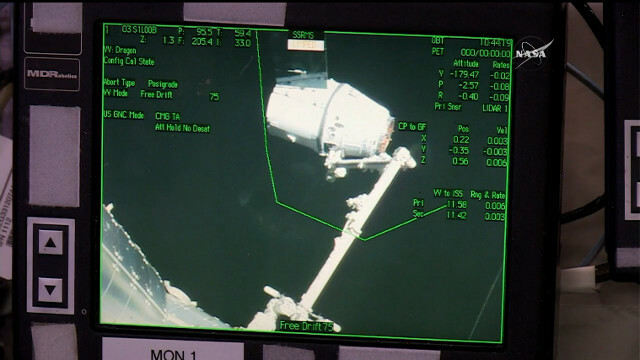 Thomas Pesquet, assisted by his colleague Shane Kimbrough, managed the operation then started moving the Dragon to the berthing point at the Harmony module. The cargo spacecraft blasted off last Sunday. The approach of the Dragon spacecraft to the International Space Station follows a procedure that has become routine but remains long and delicate. The Station’s safety is the top priority so every little step of the Dragon gets checked. Only if all goes well in the spacecraft’s position and velocity they proceed with the next step and in case of any problems can be aborted at every step. That’s exactly what happened yesterday when the Dragon’s GPS navigation system detected incorrect values ​​and its onboard computer couldn’t determine the spacecraft and the International Space Station’s relative positions. The consequence was that the approach was aborted for safety reasons. The procedure was delayed for 24 hours and today it restarted and was conducted successfully. Tomorrow the crew of the International Space Station will open the Dragon spacecraft’s hatch and will start unloading its cargo. The Dragon will remain docked to the Station for a few weeks as it’s scheduled to depart on March 23, 2017. Over the next month, a series of experiments and other items to take back to Earth will be loaded on it, which is the only cargo spacecraft able to return to Earth intact. The Dragon will leave the International Space Station with its new cargo. The CRS-10 mission will be completed with its descent into the Pacific Ocean, off the coast of California. This last phase is important as well because various in-depth analyzes of samples can only be performed in specialized laboratories on Earth. For SpaceX it’s important to have resumed its missions after the explosion of the Falcon 9 rocket that happened in September 2016. The CRS-10 mission was the beginning of new activities at Cape Canaveral’s 39A pad, which will be used by the Elon Musk’s company for some of its launches after being used for decades for Apollo and Space Shuttle missions.